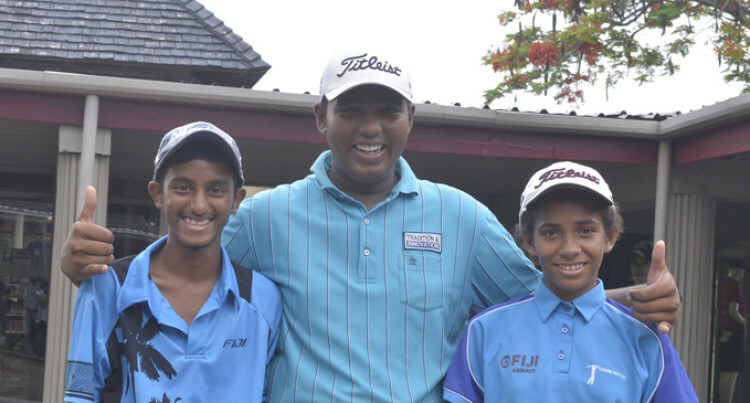 Prashal Chandra, Divesh Kumar and Emmanuela Luita excited to represent Fiji at the World Junior Golf Series in USA next week. Prashal Chandra, Divesh Kumar and Emmanuela Luita depart today to take part in the World Junior Golf Series in United States next week. The trip is organised by the Oceania Golf School in Nadi and the trio are excited to be flying Fiji’s flag after they excelled at the three trials last month. Luita, 12, of Namaka Public School, said she was ready to represent Fiji and hopes to do well. Chandra, 13 of Nadi Sangam Primary took out the Fiji Airways Junior Open Tennis Championship at the Denarau Golf and Racquet Club in Nadi. He plays on a handicap of 12, carded a total score of eight over par 152. Kumar, a Nadi Sangam SKM College student, was second with 10 over par 154 after he shot rounds of 80 and 74.